New album is "an alluring blend of Americana and west of Ireland sounds"
FIVE YEARS after their debut release, Volume 1- That Vinyl Scratch, Vickers Vimy launch their second album, Atlas Of Hearts, next Friday, March 30 at the Crane Bar. 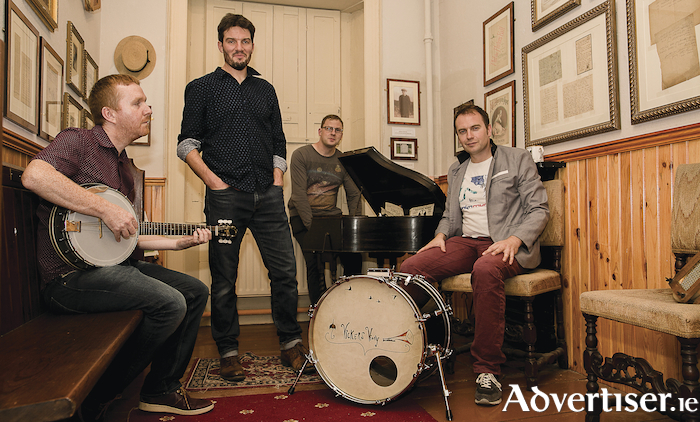 Originally from Mayo, Vickers Vimy take their name from the aircraft in which Alcock and Brown made the first transatlantic flight and their music similarly spans the Atlantic in its influences with an alluring blend of Americana and west of Ireland sounds. Their debut album drew critical accolades and much radioplay and also saw the band feature on RTE’s Big Music Train along with Christy Moore and The Whileaways. In the past they also supported John Martyn, The Hothouse Flowers, and Mundy. Vickers Vimy - founders Hanley (electric and acoustic guitars, mandolin, harmonies ), Ed Drea (vocals, acoustic guitar ), with Eamonn Mulderring (drums, percussion, piano, accordion ) and Ciarán Byrne (bass, guitars ) - should find their profile raised another few notches with Atlas Of Hearts. It is a really fine album from first to last and expands the group’s sound with the addition of brass. This infuses a number of tracks with pleasing echoes of Calexico and Love’s Forever Changes, influences which Hanley is glad to acknowledge. “We did have a vision for the album," he says. "The first album was really myself and Ed; for the second one our drummer Eamonn and bass player Ciaran came on board so the songs naturally evolved and the two lads brought a great skillset to it and enabled us to get the vision we had in our heads for the music out there. As well as being the drummer Eamonn is a really good instrumentalist, he plays piano and keyboards, and Ciaran engineered the album. "Between all that and having two other heads to bounce ideas off helped it all come together well. We knew we’d love for the single ‘Keep Your Eye on the Road’ to have a brass section so Eamonn contacted the Berrill brothers, Matthew and Peter from Headford, and they were joined by Spike Keryell Emmerson and they played brass on four or five songs. Calexico and Forever Changes are perfect examples of the kind of sound we were aiming for; Wilco would be another influence and REM – the track ‘Chicago’ was quite influenced by REM." Other memorable songs include ‘Red Moon Rising’, a murder ballad with a dark, Americana sound and ‘reverby’ guitar; ‘Peg and Hammer’ which drives along propelled by strong percussion and finger picking guitar and mandolin, ‘Bonfire of Dantes’ inspired by Fintan’s reading of Dante’s Inferno and another beguiling love song ‘Quiet Bow’. “That’s a late night tale of two lovers,” Fintan observes. “Ed had a rough demo he’d made a couple of years ago and I listened to it one night then started added in stuff and it came together, like ‘Budapest’ it came together quickly. There is not a dud track on Atlas Of Hearts, an album that invites and rewards many replays and listens. Galway gig goers can check it out at the launch gig at The Crane Bar, Good Friday, March 30, at 8.30pm. Admission is €10. Special guest is Kevin May of Guggenheim Grotto and Storyman.